BRINGING UP CPM3 FOR THE FIRST TIME ON A IDE HARD DISK BASED SYSTEM. Before you read this page please read about bringing up CPM3 on a Floppy Disk based system first. Please see here. After reading that page some parts of this page will appear the same. However there are subtle and important differences, so read carefully. Throughout I will refer to a Hard Disk. Please keep in mind that everything said below also applies to CF card "Disks" utilizing an IDE to CF card adaptor as described here. To repeat what was said on the Floppy disk page. Most early S-100 Computer systems used CPM2.2 (or earlier) as the basic computer disk operating system. The system was fairly simple to implement and was the germination base for much of the microcomputer worlds software. The system however had many limitations. In particular it was designed for a standard 8" IBM single density single sided floppy disk with 128 byte sectors. As newer disk sizes and formats started to appear -- particularly hard disks, the system started to show its limitations. Digital Research's answer was CPM3. This version of CPM allowed essentially any sector size and disk format to be used easily and efficiently. What CPM3 did was hide within the operation system itself the 128 byte sector size requirement and allow the BIOS to work easily with any sector size "transparently". The system had an elaborate disk hashing/data buffering system as well. Of particular usefulness was the fact that it existed in two forms. A "standard" NON BANKED version that operated like CPM2.2 in a Z80 system with 64K (or less) of RAM. 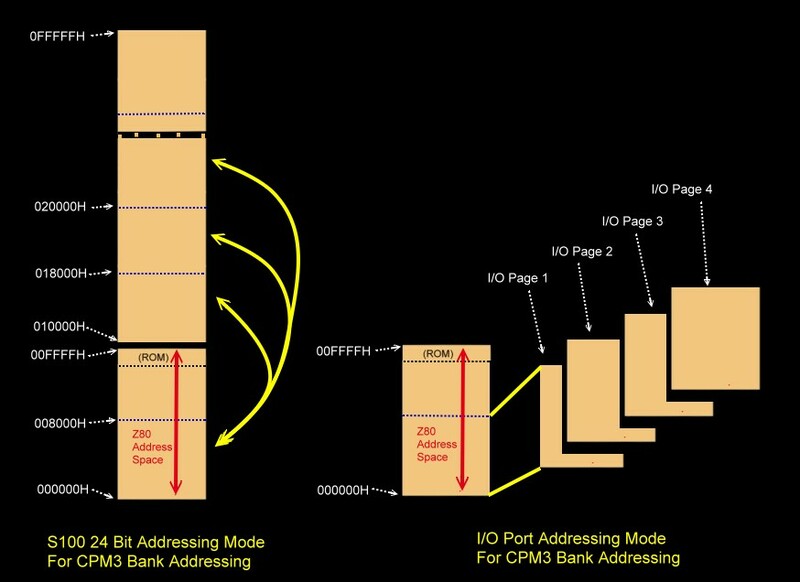 However there was a much more efficient "BANKED" version of CPM3 which by using onboard 'bank switching" hardware, could utilize up to (in theory) many megabytes of RAM. Typically 128K or 256K RAM systems were used. This allowed for a very fast and sophisticated system. It should be noted that this BANKED system absolutely requires that the Z80 can switch in and out a portion of its 64K address space with other RAM boards. There were a number of ways this was done in hardware. The Cromemco and Godbout systems utilized an IO port to switch RAM boards. Intersystem's and our own S100Computes Z80 board, use on-board Z80 CPU board hardware to extend the addressing range of the Z80. We will discuss this later. We will first start with a very simple CPM3 BIOS (for a <64K RAM), single hard disk based system. We will step by step build the system up to a much more complex setup. Eventually arriving at a BANKED system with multiple hard disks, floppies, and memory disk connections. Before we start if would be very helpful if you first look over the very detailed description Digital Research provide in their CPM3 BIOS configuration manual. One word of warning! This manual (CPM3 System Guide), is extremely detailed and contains far more detail than is typically needed. It explains in great detail how the disk parameter tables are setup etc. When you read this for the first time you may run away. Hang in there, Digital Research provided a number of assembler macro routines that do all the dirty configuration work for you. They also provided an interactive "GENCPM" program that via a series of questions and answers makes and configures a complete system for you. Thanks to PC Pete's for the CPM3 System guide. We now also have from him beautiful copies of the Digital Research CPM3 User Guide, Programmers Guide and Command Guide. These modules have to be bullet proof, but that's it. The Digital Research GENCPM will do the rest. We will write software for all these steps. Normally I have seen the process written from the bottom up. I think it is in fact easier to understand if we go from the top down. THE EPROM MULTI SECTOR HARD DISK BOOT LOADER. The first difference between a Floppy and Hard Disk system is that the CPMLDR (see below) boot process is a little simpler. Rather than read in one sector from the disk (to get disk parameters etc.) and then from that sector load in the remaining sectors, in the case of Hard disks it is common to read in all of the CPMLDR sectors at once via the EPROM Boot Loader. This is because in the case of a hard disk the format is fixed and we always know how many actual sectors are required. In the case of floppy disks the number varies depending on the sector size. Once the CPMLDR is present in RAM at 100H upwards control is transferred to it. The code at 100H is RAM is really a stripped down very compact CPM operating system (called CPMLDR.COM) that's only function in life is to read is a single CPM file on the disk named CPM3.SYS. It has to be a "proper" CPM operating system however because the CPM3.SYS file is a "normal" CPM file and can exist anywhere on the disk. In a Non-Banked system this CPM3.SYS code is placed in the top of RAM. In a Banked system much of it is placed in another RAM bank - thus freeing up much of the TPA. More on that later. We are almost home. The last step in the process is the CPM3.SYS code itself reads in a further CPM3 file called CCP.COM. This Console Command Processor file has the code that links the operating system with the outside world (console, printer etc). When this is done the CPM3.SYS code transfers control to the CCP.COM code and the A:> appears. This my seem a convoluted way of doing things -- and to some extent it is, however what is really nice is that once you have the original CPMLDR working you can easily and quickly make changes to the operating system by placing a new CPM3.SYS file on the disk. If you change the name (CPM always looks for exactly "CPM3.SYS") you can have different hardware arrangements stored on the same hard disk. Now let us look at an example of the EPROM boot loader code. My complete "MASTER.Z80" EEPROM code can be see here. See the bottom of this page for all downloads. The relevant Hard Disk boot loader code begins at HBOOTCPM: This is the monitor I use with the S100Computers Z80 CPU board. It utilizes the simple command driven interface to read disk sectors into RAM utilizing the IDE board. Other hard disk controller boards would behave essentially the same way. CALL    IDEwr8D                ;Send sec read CMD to drive. ;I have a (negative)pulse of 2.7uSec. (10Mz Z80, two IO wait states). CALL    DELAY_32               ;Need to stretch pulse! ;Wait for the drive to be ready to transfer data. ; directly to the drive controller registers, via the 8255 chip. ; in the routine MoreRD16 for speed reasons. As I explained above, we have just read in 12 sectors to RAM starting at 100H. Note how the HBOOTCPM in this case jumps to 100H in RAM once all 12 sectors have been read. It is here the CPMLDR for our hard disk CPM3 system now resides. Next we will write the CPM Loader program CPMLDR.COM. This is actually the hardest part of the software to write. We are is essence writing a primitive CPM3 BIOS for the hard disk. The good news is we don't worry about memory banking, and only have to take care of two major BIOS functions, reading sectors from (only) the Hard Disk and writing to the console. You don't even need console input -- though it is useful for debugging. In CPM3 each disk has its own Disk Parameter Block table. Unfortunately these tables (DPB's) are fairly complex and rather than repeat everything here, you should read the Digital Research CPM3 System Guide mentioned above. They contain byte and word values to define areas in RAM for sector skew translation, directory buffers and hash tables etc. We will not worry about any of this now because Digital Research provides a series of Assembler macros that builds these tables automatically for you. 1 = Number or tracks reserved for the CPM operating system. Tracks start at 0,1,2,3,.. so track 0 is reserved for the operating system. The disk directory starts on Track 1 in our case. You will see this macro at the bottom of the above code listing. Next we need another table which Digital Research calls a Disk Parameter Header table or DPH. This table is somewhat simpler than in the case of the 8" floppy disk DPH table. This time we do not need to use a sector skew so the first entry. So it is set to 0. In fact the only thing this table contains is a pointer to the above DPB table. Again an assembler macro is supplied. 0 For floppies this entry points to the "skew" macro that describes how the sectors are numbered on a track (it is not used here). HD$DPB Is a word pointer to the above DPB for the hard disk. When you look at the bottom of the code for the CPMLDR "BIOS" (HLDRBIOS.Z80) you will see all of the above combined. For more efficient use of code space I have actually hand coded the DPH table. Now in order to have a functional basic operating system we need to splice in the Digital Research CPMLDR.REL file. This a disk operating system file supplied by Digital Research that works with our basic custom BIOS. Remember all we are trying to do here is read in the main CPM3.SYS file on the disk. The CPMLDR.REL file is set to run at 100H in RAM. It is constructed such that it expects immediately above it the Loader BIOS jump vectors exactly as they are at the start of HLDRBIOS.ASM. We use the CPM program LINK to splice the two sections together and write them out as one file CPMLDR.COM. If you load this program with SID or ZSID and jump to 100H in RAM the above code should work and come back telling you it cannot locate the CPM3.SYS file on the disk. (Because we have not done it yet). However before we get to that we have to do one other thing. We need to get some way to write the CPMLDR.COM file to tracks 0 of the hard disk. I have written the program HSYSGEN.Z80 to do this (see below). Its essentially a reverse of the EPROM monitor code to write (rather than read) multiple sectors to the disk. Finally we need to splice the HSYSGEN and CPMLDR code together to yield one "standard" CPM program which I call HSYSGEN.COM. This program on any of our IDE disks or CF cards will place the above CPMLDR.com code on the system tracks. The code is a little bit more complicate than I described above because it has the option of placing a Banked or Non-Banked CPMLDR.COM file on the disk. For now everything will be for a non-banked system. All of the above assembly and splicing can be done automatically by running the HSYSGEN.SUB file. This can be see here. You can see the normal DPH begins at DOH0: Listed above it are two byte fields (unused here) that the software can use as flags for floppy disk density/format etc. CPM does not use them. Then immediately above them are four word pointers to disk the initialization, login, sector read and write routines. These are the routines you must custom write for each disk. CPM also adds table values to the bottom of the DPH. In fact from the location DPH0: the next 24 bytes must never be changed by your custom BIOS. You can add any other flags or pointers you like below that. I use two in all my floppy disk BIOS'es but we don't need any here. Take a look over the HIDE3.ASM code to get comfortable with the above. You should by now be familiar with the disk DPH and DPB macros. BTW, throughout these programs, Digital Research names all data pointers/variables beginning with a "@'. All public routines are labeled with an '?'. So ?PMSG is a globally available routine to print a message on the console. Next we have CHARIO3.ASM. As you might expect from the name this file concerns itself with getting data to and from the Console (and printer). There are elaborate mechanisms is CPM3 to set serial Baud rates etc. For this simple case just go to the bottom of the file and splice in code for your particular hardware. The code there is actually more complicates than need be because I have options to redirect output to two printers and the like. Be sure you use the correct I/O port equates for your hardware however. Then we have HBOOT3.ASM. The only function of this file in our simple system is to place an initial signon message on the screen when CPM3 signs on for the first time. If you have various system/hardware configurations, the message at the bottom of the file is a useful place to put reminders. So except for HIDE3.ASM and CHARIO3.ASM , the changes you will have to make for any hardware system are fairly simple. The other files BIOSKRNL.ASM, SCB3.ASM, MOVE3.ASM are not modified in this simple system. Next we need one other supplied Digital Research file: BDOS.SPR. This file contains the code for the core disk operating (BDOS) system that Digital Research supplied. We then utilize the special CPM3 program Digital Research supplied called GENCPM.COM. This program will take the above BDIOS3.SPR and BIOS3.SPR files and combine them to make our final CPM3.SYS file. GENCPM is an interactive program. It will ask you a number of questions about how exactly you would like your custom CPM3 operating system to function. Things like do you want long error messages, which disk you want as the boot/primary disk, how much space to set aside for directory buffers etc. Fortunately Digital Research provided good examples. The input for the GENCPM program can be read from a GENCPM.DAT file. This saves you typing in the same values each time. I provide a sample GENCPM.DAT here. The above process actually appear here more complex than it actually is. I have written the following CPM submit file that will do all of the above with a one line entry the Windows Altair CPM emulator box on the I: Drive. You next need to transfer the above CPM3.SYS file to your IDE disk /CF card. If you first did a Floppy disk CPM3 system this is easy. For people that don't have any way of transferring files to their first CF card, I can do it for them if they send on a blank card and software. Finally you need to also transfer to this same disk the Digital Research supplied CCP.COM program. With your CPMLDR code already on the disks system tracks as describe above and the two files CPM3.SYS and CCP.COM listed in the disks directory you are ready to boot CPM3! If it does not work, first from an old floppy system try loading the CPMLDR file into RAM with SID. Switch disks and go to 100H. The system should boot. If it does there is a problem with your boot loader. Alternatively you can boot from an 8" Floppy disk with a non banked floppy based version of CPM3 as described here, but instead of using the floppy CPM3.sys file place the Hard Disk CPM3.sys file described above on the floppy disk. It should come up with the hard disk on drive A: If you still have problems then back off and modify you floppy based system such that your Hard Disk is drive C: This way form a working floppy system you can debug the IDE Hard Disk on drive C: using the diagnostic program MYIDE.ASM. Also the old public domain CPM disk diagnostic program "DU.COM" is quite useful for seeing sector contents as CPM understands them. Remember however you must be using a non-banked floppy based CPM3 system. If you still have problems then use the approach of sprinkling your BIOS code with Console character outputs (direct to hardware, not via CPM) at various points to see where the problem lies. One nice thing about the new IDE board (Version 3) is you can always see what drive, track and sector is being addressed. Directory reads for example are on Track 1. The boot loader should start on Track 0 and step along all the way up to Track 1, sector 0CH. A SIMPLE BANKED CPM3 VERSION FOR A SINGLE IDE HARD DISK/CF CARD. Next we will move up to a banked version of CPM3 in the same system. As I said above, CPM3 comes in two flavors. A "Non-Banked" system where up to 64K of RAM can be utilized to run the operation system and application(s). The second much more powerful approach is a "Banked" system. This utilizes two or more S-100 memory cards to switch in or out various blocks of memory and yet still remain within the 64K memory addressing capability of the Z80. Typically the bank is a 16 or 32K block of RAM that transitions in or out of the CPU's 16 bit address space. These banks can be port selected utilizing the S-100 phantom line and/or by activating and inactivation a port on certain S100 RAM boards which by using onboard 'bank switching" hardware, could utilize up to (in theory) many megabytes of RAM. Typically 128K or 256K RAM systems were used. This allowed for a very fast and sophisticated system. It should be noted that this BANKED system absolutely requires that the Z80 has hardware that can switch in and out a portion of its 64K address space with other RAM boards. There were a number of ways this was done in hardware. The Cromemco and Godbout systems utilized an IO port to switch RAM boards. Intersystem's and our own S100Computes Z80 board, use on-board Z80 CPU board hardware to extend the addressing range of the Z80. They both behave the same in terms of software. Digital Research referred to these "extra" memory blocks of RAM as "Banks". In a typical CPM3 Banked system there are usually two, sometimes 3 banks. 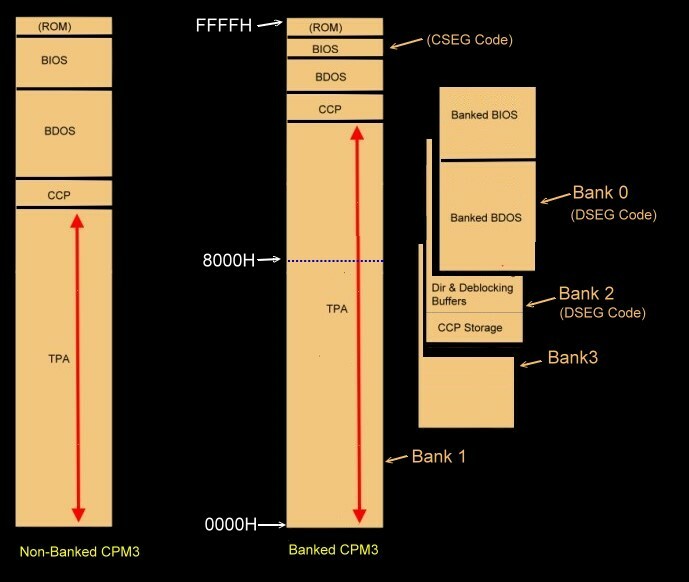 Where these banks "split" in the Z80's 64K address space varies with the hardware. With our S100Computers Z80 board this is completely determined by software. Not so typically, in I/O port driven systems. A common split is at the 8000H or C000H boundary. In a banked CPM3 system, the Monitor/EPROM Boot loads the CPM3 CPMLDR.COM from the disk system tracks into RAM at 100H exactly as described above for the non-banked system. However once control is passed to the CPMLDR at 100H in RAM, things go differently. The first thing the loader does in a banked system is open up an alternative bank of RAM above/outside the Z80's 64K address space. As I said above this is quite hardware dependent and varies from system to system. It's very important to understand that the Z80 itself does not know anything has happened. It all the time sees one large block of 64K RAM. In fact while it thinks it is operating on RAM 0 to ~4K it is in fact using RAM from 1000H upwards ~4K. The CPMLDR then loads in the main CPM3.SYS file from the disk as we described above for the non-banked system but this time instead of dumping everything in high memory, it distributes the contents both in high memory (a small portion) and the rest in our Bank 1 memory (the major portion of code). How CPM does this we will discuss in a moment. What part goes where is the tricky part of writing a good CPM3 BIOS. In all the BIOS code we will look at you will see chunks assigned to "Common Memory Segments" (CSEG's) or "Data Memory Segments" (DSEG's). CSEG portions of the BIOS code always reside above and outside the Banked switching region of RAM in high memory. They never change, any addresses are absolute and can always count on being there. In other words the code behaves like Non-Banked BIOS code. DSEG BIOS code on the other hand resides in Bank 0 RAM (or other Banks). Nothing special about the code itself within this segment either. What is special is when you jump back and forth between code in DSEG RAM and CSEG RAM. 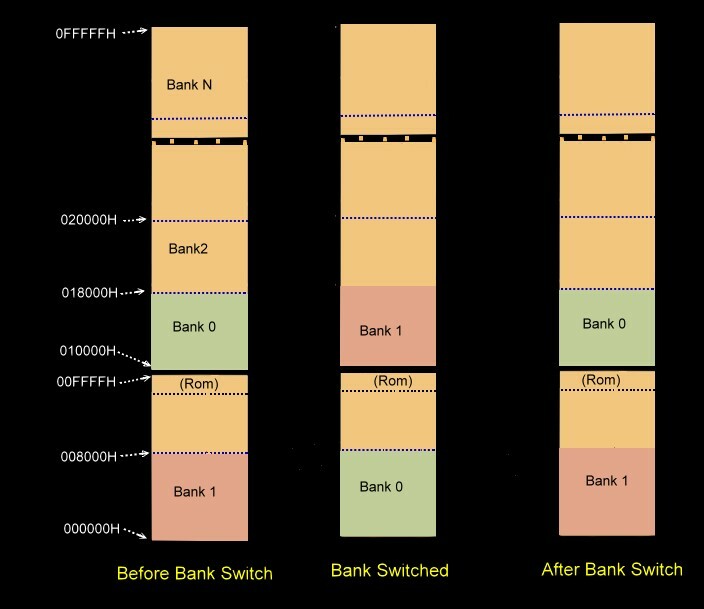 Before you make a jump say from code in DSEG to a CSEG, you need to save the current bank number, switch banks so Bank1 is contiguous with the CSEG code above the bank switching area in high memory and then jump from that DSEG (now in the contiguous 64K RAM space) to CSEG code in high RAM. This is necessary because remember the Z80 never knows banks are switched. If the code in CSEG just jumped to a region below the bank boundary it would not find the CSEG code there. (It is in fact, way up above 10000H in RAM). And transfer the data to the correct location. Further down we see we reverse the process. CALL   IDEwr8D       ;Send sec read command to drive. This bank switching process may seem a bit confusing at first but you quickly get used to it. Remember any time you wish to jump across from a DSEG code to a piece of CSEG code you must change/check segments first. As we shall see if you have a solid Non-banked CPM3 BIOS working, its not too hard to hammer it into a Banked mode of operation. More on that in a moment. Before we get to that however we need to go back to one thing again, CPM's tables, specifically the DPB's, DPH's and XDPH's. Simply stated, all DPH and SKEW tables can be and usually are placed in Banked memory (DSEG's) but all DPB tables must reside in CSEG memory. 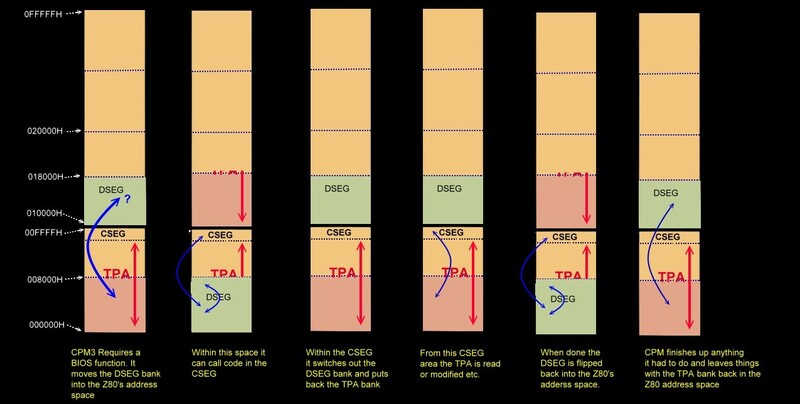 As you build your Banked BIOS start with everything in CSEG's and gradually move as much as you can across to banked (DSEG) RAM thereby freeing up the TPA. One very common mistake of beginners is to have the DPB table in the DSEG/Banked memory. This can lead to much frustration and debugging! The absolute kernel code of switching banks and moving blocks of code from one bank to another in CPM3 is all completely contained within a module called MOVE3.ASM. This file contains code to move 128 byte blocks of memory data either within a CSEG or DSEG area (Intra-Bank Moves) or 128 bytes from one bank to another (Inter-Bank Moves). It also contains code to do the hardware switching of banks (?BANK:). This MOVE.ASM module is perhaps the hardest piece of code to understand in the whole of the CPM3 BIOS. It absolutely has to be reliable. Unfortunately it is also very hardware dependent. The example I have below is for our S100Computers (or Intersystem's) Z80 CPU boards. In this case we use the S-100 bus extended memory address space and one of the 4MG Static RAM boards. If you use the I/O port mode of bank switching (e.g. Cromemco or CompuPro etc) you will have to rewrite the kernel of the code. Writing Banked CPM3 BIOS Code. The process of writing BIOS modules for a banked BIOS version of CPM3 is essentially the same as describe above for the non-banked version -- with one very important exception - each .ASM file has the "BANKED" equate set to "TRUE" at the start of each file. This includes the Digital Research supplied file BIOSKRNL.ASM. In all the files except the memory banks/RAM move and Floppy disk related BIOS code files (HIDE3.ASM and HMOVE3.ASM) any other changes are minor. Please look over careful the file HIDE3.ASM. It is still the same basic code as for the non-banked version, but it incorporates the bank switching functions discussed above. Try and really understand this file before going any further. ;A: & B: are 8" Floppy disks. ;This will be a Banked version. ; Now copy the cpm3.sys to your 8" bootable floppy. ; Make sure the file ccp.com is there as well. ; Use ZSYSGEN.COM to write a system on the disk. From here on the process for the Banked and Non-banked versions of CPM3 are identical. You next need to transfer the above CPM3.SYS file to the Hard Disk as we discussed above for the non banked version. With your CPMLDR code already on the disks system tracks as describe above and the two files CPM3.SYS and CCP.COM listed in the disks directory you are ready to boot the banked version of CPM3! If it does not work, as before first from an old CPM 2.2 system try loading the CPMLDR file into RAM with SID. Switch disks and go to 100H. The system should boot. If it does there is a problem with your banked version of the boot loader. Alternatively you can boot from an 8" Floppy disk banked based version of CPM3 as described here, but instead of using the floppy CPM3.sys file place the Hard Disk CPM3.sys file described above on the floppy disk. It should come up with the hard disk on drive A: If you still have problems then back off and modify you floppy based system such that your Hard Disk is drive C: This way form a working floppy system you can debug the IDE Hard Disk on drive C: using the diagnostic program MYIDE.ASM. Also the old public domain CPM disk diagnostic program "DU.COM" is quite useful for seeing sector contents as CPM understands them. Remember however you must be using a Banked floppy based CPM3 system. If you still have problems then again use the approach of sprinkling your BIOS code with Console character outputs (direct to hardware, not via CPM) at various points to see where the problem lies. Note all of the above assumes that your IDE board and disk drives work 100% reliable in ALL tests of the MYIDE.ASM program. program. Don't even think about all the above code unless this is so! The relevant files that match with the appropriate S-100 Boards are indicated. If you wish to install CPM3 on other boards look at the source code here it may help. Copying CPM3 to a New CF Card. There are a number of ways of making duplicate CF cards containing CPM if you have the above Dual IDE board. If you do a DIR of a commercial unused card it will show a garbage directory (a series of semicolons). Run DIR to be sure all is OK. The directory should be the same as the original card. (Assuming you have CPM3.SYS on the original disk and it was copied across). Remember if you have other user groups on the disk copy them across for them as well. (I keep all my CPM86 files on 1A: for example). NOTE: HSYSGEN writes the loader on the SAME Disk it is read from. Use with care. A New Simplified CF-CARD CPM3 Image. The above CPM description and image was put together some time back. It was originally written for use with the board and a "real" IDE hard disk, a Seagate Medalist 6531 ULTA ATA drive. This was a fairly popular drive at the time (1998), and is still often seen today on eBay. It had 13446 cylinders, 15 heads and 63 sectors/track, (6.5 GB Capacity). In order to have only one CPM3.SYS image on all my disks, all my CF cards and this hard disk, I utilized this track format for my CF card CPM images. For CPM3 I assigned 61 sectors per track (with the possibility if need be, to use the spare sectors if needed for bad sectors). Since the capacity of even the smallest CF card was way greater than the maximum disk size allowed by CPM3 (8MB), it did not seem to make sense to squeeze the CPM system into the 64 sectors that these cards lend themselves to in terms of software. In retrospect that was a mistake. Not having 64 sectors per tracks leaves "holes" in the disk sector layout when one goes to a LBA disk format scheme and makes it complicated to modify disk images and copy them to other CF cards. One day I will make the massive shift for all my disks and cards. Fortunately for others, Dave Fry and Dave Mehaffy (aka Yoda) on the Google Groups S100Computers forum have addressed this issue so that you can build a CF card CPM3 bootable image directly from a downloadable file. Dave Fry has written an excellent detailed description of the issues that I mentioned above and describes how to build a CF card CPM3 system. The above .zip file contains a massive (41 MG) amount of information including the CPM CBASIC Compiler. Thanks gentlemen for making such a wonderful contribution to help first time users get CPM3 running in their systems. More recently Dave Fry applied a small software fix to the HIDE.ASM and HLDRBIOS.ASM CP/M source files to ensure that the CF card 'Ready' status is checked after a software reset. This seems to help improve system compatibility with some older/smaller CF cards. He have also added a couple of extra user areas to make the CP/M experience a little more useful for new users. A "GAMES" user area was borrowed from the ZSOS v0.11 SBC image produced by Andrew Bingham so credit to him for compiling this collection. There are two versions of this CPM system. One for hardware where the Console I/O Propeller board is the Console. The other where the S100-Computers Serial I/O card is the console. Note:- On these images CCP.COM has the [SYS] attribute set so that it is available from any user area on program exit. The links below will contain the most recent versions of this software. Note, it may change over time and may not correlate exactly with the text in the article above.